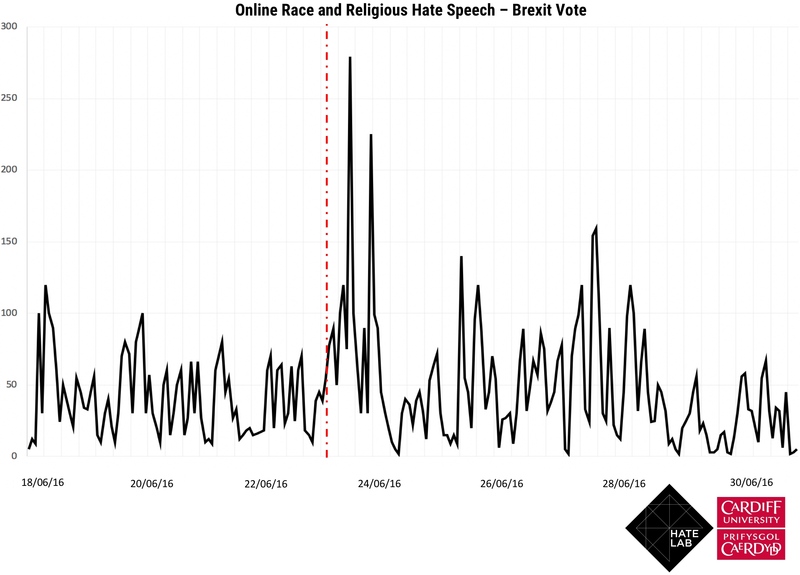 This chart shows online race and religious hate speech (both moderate and extreme) produced on Twitter around the Brexit vote, representing original tweets (i.e. excluding retweets) from the UK. Hate speech spiked in the hours and days after the vote outcome, in line with the spike in offline hate crime. Hate speech produced around the Brexit vote in particular was found to be largely driven by a small number of Twitter accounts. A large majority of anti-Muslim hate speech was produced by only a small fraction of users, many of whom identified as anti-Islam. In the months following the vote several aftershocks motivated further online hate speech, including the High Court and Supreme Court case, votes in Parliament and political speeches. HateLab also found that certain headlines published in national newspapers were associated with an increase in online hate speech.